Most armored cars during WWII only performed reconnaissance mission, and were light models armed with machine guns. There were examples of vehicles armed with a gun, not only in Great Britain, but also in the USA and USSR. 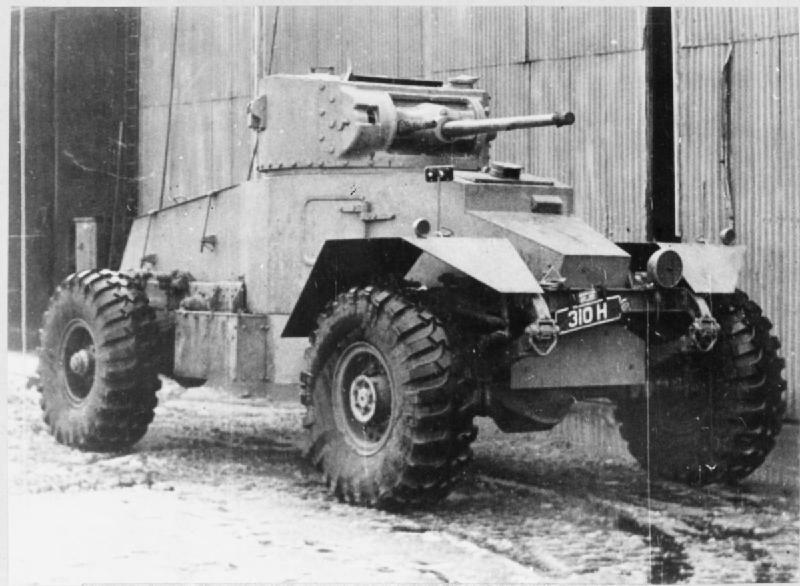 The Daimler Armoured Car, for example, was given the standard QF 2-pounder (40 mm/1.57 in), the Humber had a US-built 37 mm (1.46 in), as did M8 Greyhound, Staghound and other US-supplied models. That is not to speak of the Soviet BA-3 to BA-11 series, armed with BT/T-26 tank turrets. 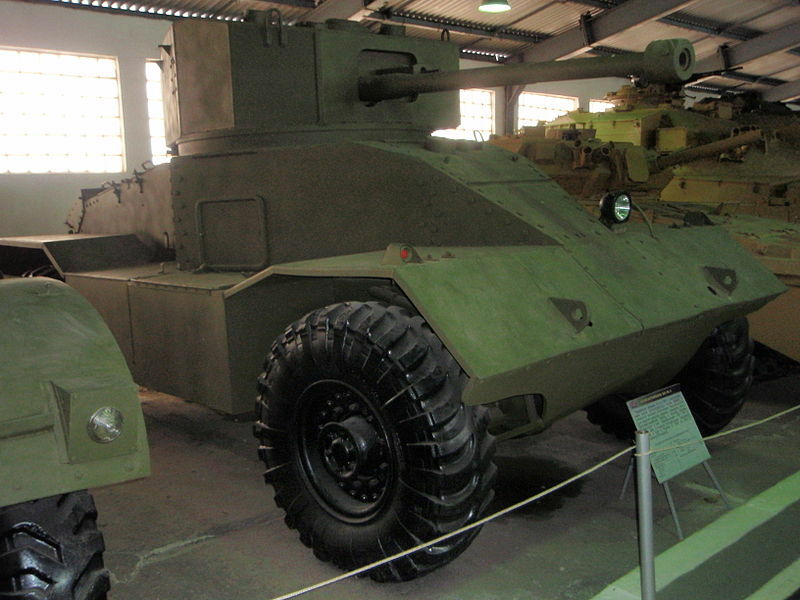 But no other armored car used during WWII was armed (and armored) so heavily as the AEC Armoured Car. 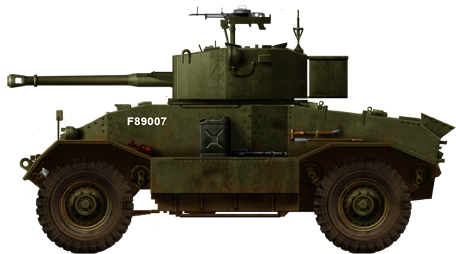 The Mark III fielded the ROQF 75 mm (2.95 in) gun, which was also fitted on the Cromwell and Churchill. AEC (Associated Equipment Company) of Southall, Middlesex, was already well known, producing buses and trucks, including the famous London double-deckers. When the war started, AEC produced military trucks, with nearly 10,000 vehicles built from 1941 until 1944. These included the 10-ton 4×4 Matador artillery tractor and the 6×6 AEC Marshall. 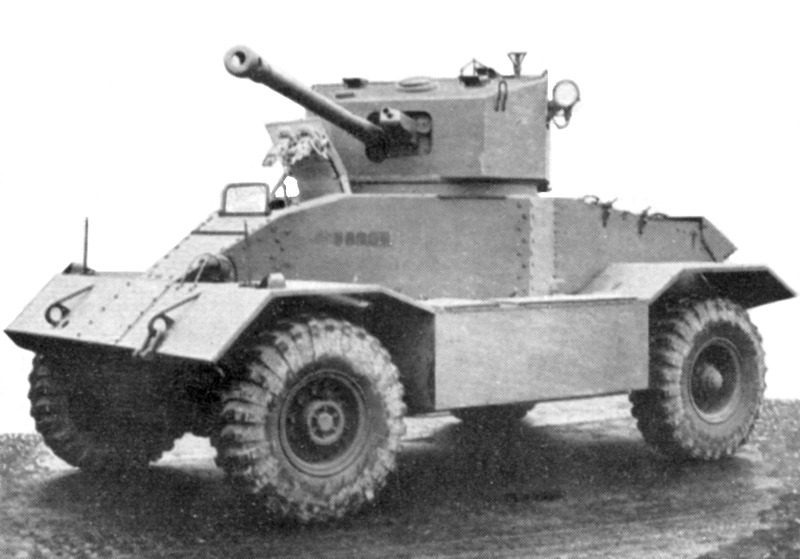 A heavy armored car was designed on the Matador chassis, as a private venture aimed at obtaining an order from the Army. The vehicle was shown publicly at the Horse Guards Parade in London in 1941, and made such an impression on Winston Churchill that an order was secured. In total 629 vehicles, in three variants, would be built until 1944. AEC used the Matador artillery truck chassis, due to the success of the 4×4 arrangement and its already powerful engine and transmission, which allowed the designers to mount some heavy armament. The idea of the chief designer was to create a “wheeled tank”, which could be produced cheaper, and in larger quantities than regular tanks. This vehicle was impressive, being long and tall, with a central, narrow, lozenge-shaped steel welded RHA body with some riveted elements. Compartmentalization was straightforward, with the driver in the narrow front section of the hull and the fighting compartment behind. This was even roomier and deeper than that of the Valentine tank, and sported a turret ring large enough to fit a standard Valentine tank turret. The engine compartment behind narrowed towards the rear of the vehicle. In addition, four large mudguards protected the massive roadwheels, with very large storage boxes in between, also acting as step-ways for the crew to climb on. The frontal armor was 65 mm (2.56 in) thick, well sloped, having an effective thickness of nearly 90 mm (3.54 in). The thickness decreased on the sides, engine deck and bottom, with a minimum of 16 mm (0.63 in). But it possessed superior protection to any armored car built in Great Britain or even by any of the Allies at the time. This came at the price of a total weight of 11 tonnes (for the first version), versus 7.75 tonnes for the Matador. But the engine was not the AEC 7.6 litre diesel (95 hp) of the artillery tractor, but a sturdy AEC 190 diesel, which developed 105 hp for a power-to-weight of 9.5 hp/ton (Mark I). This was sufficient for a top speed of about 58 to 65 km/h (36-40 mph) and an autonomy of 400 km (250 mi), still sufficient for long range patrols. Mark I: AEC 190 diesel engine, Valentine Mark I/III turret with a 2-pounder, coaxial Besa 8 mm machine-gun (0.31 in), Bren AA, crew of three, 125 built. Mark II: AEC 195 diesel (158 hp) engine, 12.7 t, heavier turret, QF 6-pdr (57 mm/2.24 in), coaxial Besa 8 mm (0.31 in), Bren AA, crew of four. Mark III: Same engine, ROQF 75 mm (2.95 in) main gun and the secondary armament as previous versions. Designated Close Support Armoured Car. 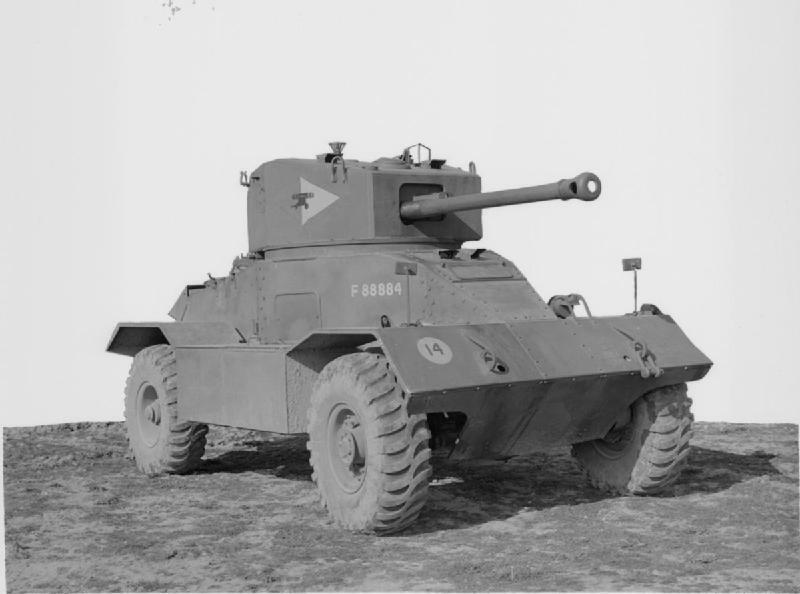 AEC AA variant: Tested with a Crusader AA turret for operations in Europe, but never produced. British Mark I in North Africa, fall 1942. 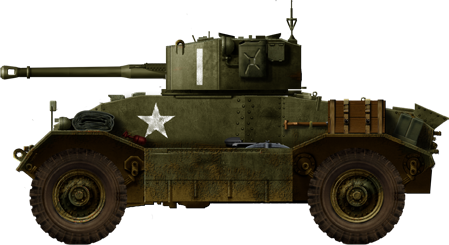 Although better armed and armored than any other wheeled vehicle of the time, the AEC was neither agile, nor fast for a wheeled vehicle. Its height made it an easy target to spot. Tactically, reconnaissance units used a few AECs for support. The first use of the vehicle came in 1942, when the first production vehicles were sent to the North African front. It is not known, however, if they participated in the El Alamein battle in November, but they were affected to the VIIIth army. These vehicles were noted as transitional models or early Mark 2s, being fitted with Crusader tank turrets mounting a 6 pounder (57 mm/2.24 in) gun. 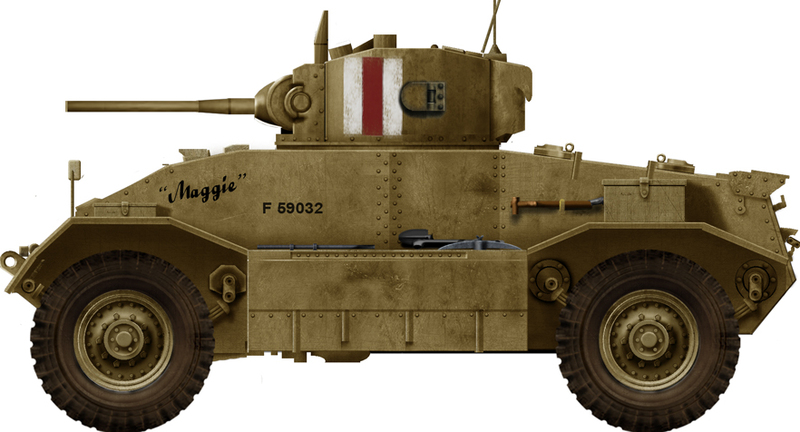 AECs were mostly used in the latter part of the campaign, until the end of the Tunisian campaign, by British forces and the British Indian Army, in complement to US-built Staghounds. These vehicles also participated in the operations in Italy, while most Mark 3s served in Western Europe, Northern France and the Low Countries, until 1945. The AEC remained very influential, and was kept into service until 1958, when it was replaced gradually by the Alvis Saladin. The Lebanese army purchased some vehicles, that were used until 1976. 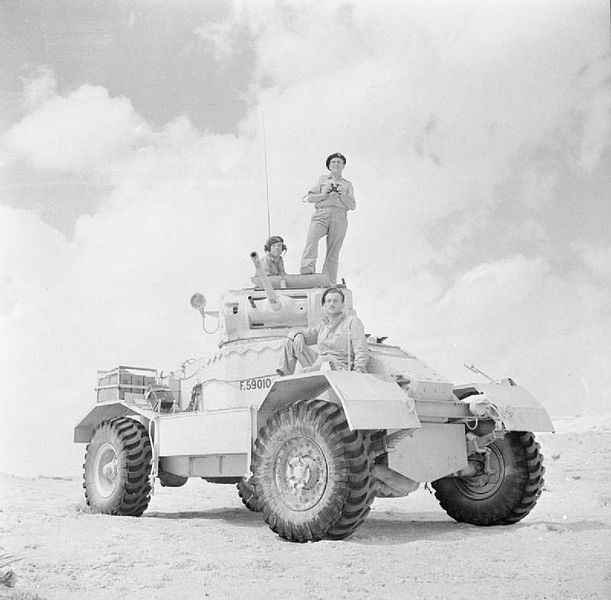 AEC Mark I, El Alamein, November 1942. 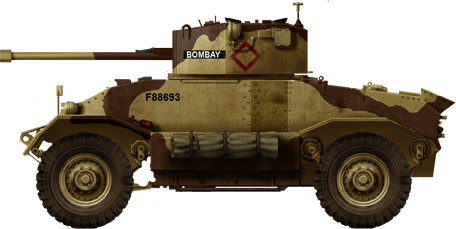 AEC Mark II, 10th Indian Infantry Division, Italy, 1943. AEC Mark II, Italy, winter 1944 (now preserved at Bovington). 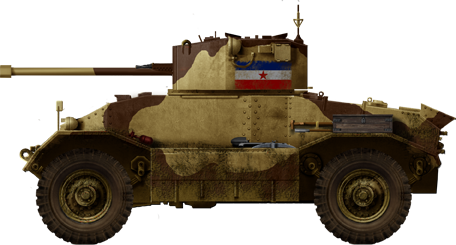 AEC Mark II used by the Yugoslav Army in 1945. AEC Mark III, D Squadron, 2nd Household Regiment, VII corps, Normandy, 1944. AEC Mk.III, , 2nd British Army, North-West Europe, spring 1945. Do you have a reference for the Crusader turrets being installed on the AEC’s in 1942? I love this vehicle. Are there reports of its use in combat? Best guess, they took surplus welded turrets and put them on the AEC after they shifted Churchill production to the cast turret in 1943. Or possibly they upgraded existing Churchill III to IV by removing the welded turret and 6 pounder and replacing it with the cast turret and the QF75mm gun; thus freeing up more than 600 welded turrets with the 6 pounder, a gun that was second-string by 1943. I’m no expert, but that’s what the pictures labeled AEC Mk II show: a Churchill Mk III welded turret with a 6 pounder gun. The two at the bottom, of the AEC Mk III, appear to show the welded Churchill turret mounting a 75mm gun of some sort. More research is required here. thank you for your consideration and well stated points. I would however point out that you are mistaken, although this may be partially the fault of the article. 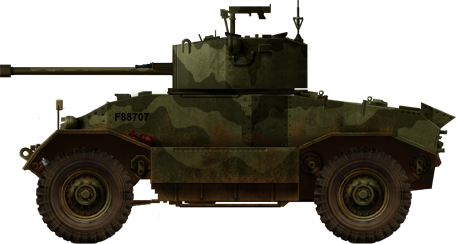 The early MkII cars were fitted with Crusader turrets, these are commonly known as ‘MK II Transitional’ although this is not an official designation used in the war. 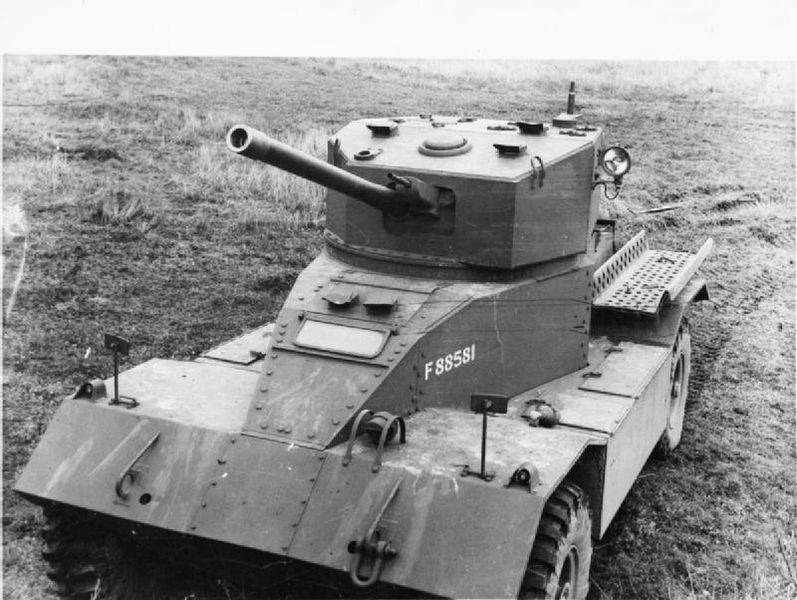 The later production model cars were fitted with a welded turret that you see in the photos, it is however not a Churchill turret. The turret on the AEC is smaller, it also has a noticeably different angle on the side plates as opposed to the straight profile on the Churchill Mk III and the forward section of the roof slopes down noticably. Thank you for answering. The Crusader turret is quite distinctive, and I’ve never seen a photograph of it on the AEC; thus the skepticism. I am, however, interested in the turret used in the final Mk II and the Mk III and in the gallery photo. It looks similar to the Churchill, but you’re right, it isn’t the same. I’m interested in how much smaller, and where they saved space; because the gun is the same – the 6 pounder and later the 75mm – QF I believe. The slope is distinctive; the armor is reduced, I’d guess. I’m just trying to understand the thinking behind the design decision. They recycle first the Valentine turret, then the Crusader turret, and in the end they come up with something vaguely like the Churchill turret, but actually quite different from it. I’d guess they were trying to get it into the field in some “race against time” scenario. I’d ask the designers, if I could, what they originally had in mind. I can see that what they ended up with is a good thing, and I imagine that the original idea may have been something like, “Let’s put a tank turret on an armored car.” I wonder, then, if the AEC designers looked to the Churchill “profile” for guidance, given that the guns they put into it are the same as used in the Churchill? Did they say, let’s look at those blueprints for the light Churchill turret (because speed is essential), which is made for these guns, and scale it down? Perhaps someone knows? I appreciate and trust your scholarship, and I would love to see a period photograph of the transitional model with the closed-clamshell-like Crusader turret. I hope someone can dig one up. Hi. I have been making models for many years and only this week have I decided to move on to military vehicles. As a result, I have just purchased the MiniArt AEC Mk.III Armoured Car kit and hope to start it shortly. I have noticed in the instructions that even though they give a detailed list of what paints are required, there is hardly anything to tell you what colors all the mainly internal parts are. They say that the internal structure is painted white but that is all. I would have thought that even the engine and suspension etc would have an identified color code. The outside color scheme is very detailed and not a problem. So, I have now spent 2 days searching the internet trying to find out if anyone has documented the full color scheme and I found your website. Are you able to either tell me or direct me to where I can obtain all the color information I need for the Mk.III? I think the Crusader turreted AEC is a myth. There has never been any photographic evidence. 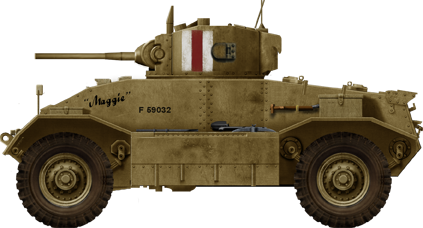 However there was a vehicle known as the AEC Griffin, which was a Mk I hull with a new turret, vaguely Crusader like, mounting a 6 pdr artillery pattern gun, that was built in South Africa and earmarked to be made to the number of 30, to be used until the Mk II AEC came into service. Whether any were eventually built is not known but there is a photo of a prototype in David Fletcher’s ‘The Universal tank’ on page 6. I suspect this is where the Crusader turret AEC has come from, and also possibly due to confusion with the Staghound Mk III, which did have a Crusader turret, fitted with a British 75mm gun. These were built to the tune of 100 and some were issued in 1945. No flash on El Alamein mk.I, it was discontinued first part of 1942. No Kings Dragoon Guards on XII corps NWE, nope, nein, nada, it was in Italy. Even IWM got it wrong.